diaCRITIC Andrew Lam gave this speech in 2014 at a high school where students raised funds to help flood victims in central Vietnam. To commemorate the 41st anniversary of the end of the Vietnam War on April 30th, we will revisit his words. 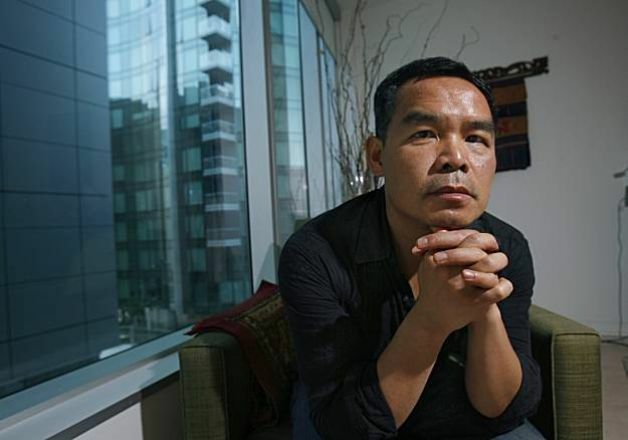 This day also marks Lam’s 41st year living in America, having fled Vietnam as a child two days before the war ended. I struggle to figure out what exactly to say today about Vietnam and the experiences that we all carry. My relationship with it remains complicated, and it is one with so many contradictions and without any final resolution. My Vietnam experience keeps on changing with the times. I left Vietnam at 11 at the end of the war. We lost everything when we came to America. We started over from the bottom. There was a period in which we lived as impoverished exiles, sharing an apartment with two other Vietnamese refugee families at the end of Mission Street where San Francisco ended and the working class neighborhood of Daly City began. We struggled for some time to make it to the middle class. There was a time when we were wrecked with losses and longings. Vietnam, as some of you who are old enough to remember know, was never an easy-to-quantify topic, and a hard-to-frame story. The issue of Vietnam keeps changing, but as a writer and as someone who came from that country I wonder if in so much writing that involves the word “Vietnam”, we really are talking about the same country at all. – Global Post: Which is America’s longest war, Afghanistan or Vietnam? Often times when we mention the word “Vietnam” in the US, we don’t mean Vietnam as a country. Vietnam is not Thailand or Malaysia. Its relation to the US is special: it has become a vault filled with tragic metaphors – it stands for American loss of innocence, of tragedy, legacy of defeat, and failure. For the first time in our history Americans were caught in the past, haunted by unanswerable questions, confronted with a tragic ending. Then there’s my father, who only talks about the Vietnam of wartime after a few drinks. When he gets drunk his memories go back to the time when he was a big shot, a warrior, when he fought battles and won, a time when he was still full of vigor and promises. But he can’t talk about the aftermath, about losing and the end and ensuing humiliation and the horrible losses. Of his comrades and his own brother sent to reeducation camps. Of the soldiers he left behind when he escaped. He can only go further backward to a time before the war was lost. He holds so much anger still about what happened to Vietnam, to his comrades, that he, like so many of his generation, hasn’t been able to go past vehemence, hasn’t been able to make peace with the past. I’ve been back to Vietnam many times. And each time I’ve come back, I have tried to put Vietnam into some perspective. And as I moved out of my father’s point of view, away from his shadows, I find that there are always more ways of looking at that country. Some years ago, for instance, I went back to Vietnam to participate in a PBS documentary called My Journey Home and I did the touristy thing: I went to Cu Chi Tunnel, in Tay Ninh Province, bordering Cambodia, a complex underground labyrinth in which the Viet Cong hid during the war many years ago. She routinely crawls through the same tunnel with foreigners, but she emerges with different ideas. Her head is filled with the Golden Gate Bridge and cable cars and two-tiered freeways and Hollywood and Universal Studios. “I have many friends over there now,” she said, her eyes dreamy, reflecting the collective desire of Vietnamese youth. “They invite me to come. I’m saving money for this amazing trip.” If she could, she told me, she would go and study in America. So there I was standing at the mouth of the tunnel, and thinking, in the end, there may never be a final conclusion about that war. There’s the northern Vietnamese version of the war where they liberated the south and saved those in the south from American imperialism. There’s the version that we exiles tell in which the date marks the day we lost a country. There are plenty of stories of Vietnamese fleeing from oppression as boat people. Tens of thousands more were sent to re-education camps. There are stories of young men fleeing from a war in Cambodia in which the Vietnamese were the imperialists. There are of course the stories of American veterans coming back to look at their losses and make peace with the past. Which is to say, the Vietnam War was a war with so many sides and it’s complicated by multiple points of view. In that sense when we talk about Vietnam we should not simplify but expand toward the multitudes, so much so that it becomes the story of people, of human beings, rather than some purported metaphor for tragedy. The more mature response to one’s tragedy is not hatred nor resentment but a spiritual resilience with which one can, again and again, struggle to transcend one’s own biographical limitations. History is trapped in me, indeed, but history is also mine to work out, to disseminate, to discern and appropriate, and to finally transform into aesthetic self-expression. So I write. And write. And write. And it is in stories about Vietnam, in looking at its current needs and its current problems, and trying to offer some insights, that I find my way home. A young Vietnamese American friend of mine from Los Angeles, whose sister was killed by Thai pirates while escaping Vietnam, recently returned to Saigon, where she is now a thriving entrepreneur. Another, the son of a colonel who spent 14 years in re-education, spent his honeymoon in Vietnam, despite his dislike of the Hanoi regime. Yet another friend, whose father was governor of Hue and who was in solitary confinement under communism for years, well, he came back, wrote a book and now owns a popular bar in Hanoi. My cousin, whose family was robbed of everything and fled to France, has returned and married a local woman, raised a family, and sells French wines. He’s prospering where his father once suffered in its malaria infested re-education camp. That was, in a sense, his best revenge. Another friend went a step further: she was forced to escape as a boat person with her family in the late 70s, but has returned with money raised in Silicon Valley to help create a program to prevent impoverished families in Mekong Delta from selling their children to traffickers. She’s changing the destinies of many others like her for the better. Having lost the war, these people have emerged as victors of the peace. They’ve managed to remake themselves and go on with their lives, and, more importantly, by refusing to let rage and need for vengeance dominate their hearts, some have become active agents in changing Vietnam itself. So, in the end, only lives lived every day matter, only when one tries his best to influence and create a better future all of mankind matters. Only when one addresses the needs and sufferings of the living are the ghosts of the past appeased. And only when one looks at Vietnam not through the view that’s rooted in historical vehemence, but through the view of human kindness, does the country open itself up. It is easier said than done, I know. Rage and sadness sometimes flare up in me and it feels as if nothing in the world could ever douse it. That is if we want see Vietnam, or for that matter any country, beyond its geo-politics, its historical relationship with the US, then we need to open our hearts. If we want to see human liberty, then we best try to uphold human dignity. And if we want to find peace, we must find a way to forgive others, and, just as importantly, if not more, forgive ourselves. It’s what I, despite the sadness and burden of memories, strive for. And in the face of human suffering, I hope it’s what we’d all strive for. Andrew Lam is an editor with New America Media and the author of Perfume Dreams: Reflections on the Vietnamese Diaspora and East Eats West: Writing in Two Hemispheres. His latest book, Birds of Paradise Lost, was published March, 2013. This post is part of diaCRITICS’ Vietnamese American Literary Series, OUT OF THE MARGINS, launched in 2015-16. The series curates literary work from poets, writers and artists of Vietnamese-American and Vietnamese diasporic experience. Our mission is to create an inclusive, diverse, provocative, ongoing space for voices and visions from this community, thus bringing them out of the margins. Dao Strom is the series editor and curator. Do you enjoy reading diaCRITICS? Then please consider subscribing! Please take the time to rate this post (above) and share it (below). Ratings for top posts are listed on the sidebar. Sharing (on email, Facebook, etc.) helps spread the word about diaCRITICS. And join the conversation and leave a comment! My name is An Nguyễn. I am neither a writer nor a translator, but someone who has enjoyed your writing a lot. I have taken the liberty of translating your speech and share it with a few friends in my blog. I hope that it is ok with you and I will remove it if it is not. This is my translation. Your feedback would be greatly appreciated. Andrew Lam là tác giả của Perfume Dreams: Reflections on the Vietnamese Diaspora và East Eats West: Writing in Two Hemispheres. Cuốn sách mới nhất của anh, Birds of Paradise Lost, đã được xuất bản vào tháng Ba, 2013. Đây là bài nói chuyện của anh năm 2014 tại một trường trung học nơi mà học sinh đã quyên tiền cho nạn nhân bão lụt tại miền trung Việt Nam. Tôi băn khoăn không biết nói gì về Việt Nam và những kinh nghiệm mà tất cả chúng ta mang theo. Cái ràng buộc tôi với Việt Nam vẫn còn phức tạp và là một quan hệ có nhiều mâu thuẫn, mãi chưa giải quyết xong. Kinh nghiệm Việt Nam của tôi vẫn cứ thay đổi mãi với thời gian. Tôi rời Việt Nam khi lên 11 lúc cuộc chiến vừa tàn. Gia đình chúng tôi sang Mỹ với hai bàn tay trắng và đã phải làm lại từ đầu. Có giai đoạn chúng tôi đã sống kiếp tha hương túng thiếu, phải ở chung với hai gia đình Việt Nam khác trong một chung cư cuối đường Mission nơi San Francisco giáp ranh với khu lao động của thành phố Daly City. Chúng tôi cố để vươn lên tới tầng lớp trung lưu. Có lúc chúng tôi đã ngụp lặn trong những mất mát và ước ao. Những vị đủ lớn để nhớ thì biết đấy, Việt Nam không phải là một đề tài dễ-đo-lường, và là một câu truyện khó-có-thể-đóng-khung. Vấn đề Việt Nam vẫn tiếp tục thay đổi, nhưng là một văn sĩ và một người đến từ mảnh đất ấy, tôi thắc mắc không biết trong tất cả những viết lách có dính đến chữ “Việt Nam”, chúng ta có thực sự nói về cùng một quốc gia hay không. -CNN: Vấn đề A-Phú-Hãn bị ám ảnh bởi bóng ma Việt Nam. – London Telegraph: Barack Obama phải thôi do dự- kẻo không thì A-Phú-Hãn sẽ là Việt Nam của ông. -New York Times: Một hướng dẫn kiểu chiến tranh Việt Nam cho A-Phụ́-Hãn. -Baltimore Sun: A-Phú-Hãn là Việt Nam của Obama. -Global Post: Cuộc chiến nào của Mỹ dai dẳng nhất, A-Phú-Hãn hay Việt Nam? Thường thì khi nhắc đến từ “Việt Nam” bên Hoa Kỳ, người ta không nói đến Việt Nam như một quốc gia. Không như Thái Lan hay Mã Lai Á. Chữ Việt Nam có một tương quan đặc biệt với người Mỹ: nó đã thành một cái nhà kho chất đầy những ám dụ bi thảm- biểu tượng cho sự mất ngây thơ, cho thảm kịch, cho hệ quả của sự thua trận, và cho sự thất bại. Lần đầu tiên trong lịch sử của chúng ta, người Mỹ đã bị sa lầy trong quá khứ, đã bị ám ảnh bởi những câu hỏi không có câu trả lời, và đã phải đối diện với một kết cục bi thảm. Rồi còn cha tôi, một người chỉ nói chuyện Việt Nam thời chiến sau khi đã uống vài ly. Khi say cụ nhớ lại thời còn làm lớn, thời còn là chiến sĩ đánh giặc và thắng trận, cái thời của khí phách và hứa hẹn. Nhưng cụ không thể nói về cái kết cục, về sự thua cuộc và nỗi tủi nhục và những mất mát thê thảm. Về những đồng đội và người em ruột phải đi cải tạo. Về những người lính đã để lại khi cụ trốn chạy. Tôi đã trở lại Việt Nam nhiều lần. Và lần nào tôi cũng cố đặt Việt Nam vào một góc nhìn nào đó. Và khi tôi thoát ra khỏi quan điểm của cha tôi, ra khỏi bóng của người, tôi nhận ra là có nhiều cách nhìn về cái quê hương ấy. Chẳng hạn như vài năm trước đây khi tôi về Việt Nam để cùng làm một cuốn phim tài liệu PBS tên là Chuyến Về Nhà của Tôi và tôi đã làm một cái trò rất ư là du khách: Tôi đã đến đường hầm Củ Chi ở Tây Ninh, cạnh Cam Bốt, một hệ thống những đường hầm chằng chịt như mê lộ nơi Việt Cộng đã ẩn trú trong một cuộc chiến cách đây nhiều năm. Cô thường phải chui trong cùng đường hầm với những người ngoại quốc, nhưng khi chui ra thì cô lại có ý tưởng khác. Trong đầu cô có đầy hình ảnh của Cầu Vàng và xe cáp và xa lộ hai tầng và Hollywood và phim trường Universal Studios. “ Giờ tôi có nhiều bạn bè bên đó lắm,” cô nói mà đôi mắt mơ màng với ước vọng chung của tuổi trẻ Việt Nam. “ Họ mời tôi sang. Tôi đang để dành tiền cho chuyến đi hoành tráng này.” Nếu có thể, cô nói, cô sẽ sang Mỹ học. Và thế là tôi đứng ở miệng hầm mà suy nghĩ rằng, cuối cùng thì có lẽ cuộc chiến này sẽ không bao giờ có một kết cục. Người miền bắc xem đấy là một cuộc chiến mà họ giải phóng miền nam khỏi tay đế quốc Mỹ. Những người Việt lưu vong chúng tôi thì khắc cốt ghi tâm ngày mất nước. Không thiếu gì truyện thuyền nhân người Việt đã bỏ xứ ra đi để thoát khỏi ách kềm kẹp. Hàng chục ngàn người khác bị gửi đi những trại cải tạo. Còn có truyện những thanh niên chạy giặc ở Cam Bốt nơi mà người Việt là đoàn quân đế quốc xâm lược. Và dĩ nhiên, truyện của những người cựu chiến binh chiến tranh Việt Nam trở về để nhìn lại mất mát và để làm hòa với quá khứ. Đây là một thiếu nữ sanh ra sau khi cuộc chiến đã tàn, khi nhìn vào đường hầm trước đây là tổng hành dinh của Việt Cộng thì nàng đã thấy gì? Magic Kingdom. Đương nhiên có những người được đường hầm Củ Chi đưa trở lại quá khứ, nhưng với cô hướng dẫn viên du lịch trẻ tuổi này thì nó có thể sẽ mang lại tương lai. Việt Nam quả tình là một quốc gia nhiều người trẻ và đã tăng gấp đôi kể từ khi cuộc chiến đã chấm dứt, bây giờ con số lên tới hơn 95 triệu. “ Giờ tôi có nhiều bạn bè bên đó lắm,” cô nói mà đôi mắt mơ màng với ước vọng chung của tuổi trẻ Việt Nam. Nói một cách khác, chiến tranh Việt Nam là một cuộc chiến nhiều góc cạnh và còn phức tạp hơn nữa vì quá nhiều quan điểm. Do đó khi nói về Việt Nam ta chẳng nên giản dị hóa mà hãy giang rộng vòng tay để nó trở thành câu truyện dân gian, của con người, thay vì là một thứ ẩn dụ cho bi kịch. Và qua những câu truyện về Việt Nam, khi nhìn vào những nhu cầu và vấn đề hiện tại, và khi cố đóng góp vài nhận định, mà tôi đã tìm thấy đường về. Và không chỉ mình tôi đâu. Một người bạn trẻ người Mỹ gốc Việt của tôi ở Los Angeles có người chị bị giết bởi hải tặc Thái trên đường tị nạn, cô mới trở lại Sài Gòn, và giờ này đã là một doanh nhân thành công. Một người khác, cha là đại tá từng bị cải tạo 14 năm, đã đi hưởng tuần trăng mật ở Việt Nam mặc dù ghét cay ghét đắng chế độ Hà Nội. Lại một người khác, cha bị biệt giam nhiều năm dưới chế độ Cộng sản, rồi một ngày anh ta trở về, viết một cuốn sách và giờ làm chủ một quán bar đông khách ở Hà Nội. Người em họ của tôi, gia đình mất hết của cải phải chạy sang Pháp, đã trở lại lập gia đình ở Việt Nam và mở tiệm bán rượu vang Pháp. Chú đã thành công ngay ở nơi mà cha chú trước đây đã bị giam cầm trong trại tập trung đầy muỗi mòng sốt rét. Đó có lẽ cũng là một hình thức báo thù hay nhất. Một người bạn khác đi thêm một bước xa hơn: cuối thập niên 70, chị và gia đình phải trốn bằng thuyền, nhưng chị đã trở lại, mang theo tiền quyên góp được ở Silicon Valley để thiết lập chương trình nhằm giúp đỡ những gia đình nghèo khó ở vùng đồng bằng sông Cửu Long để họ khỏi phải bán con cho lũ buôn bán phụ nữ, trẻ con. Tuy thua trận chiến nhưng những người này đã trở thành kẻ thắng hòa bình. Họ đã làm lại cuộc đời, và, quan trọng hơn cả, đã không để lòng thù hận và phẫn nộ chế ngự tâm hồn, và có người còn trở thành những tác nhân tích cực trong công cuộc thay đổi đất nước Việt Nam. Cuối cùng thì chỉ có những cuộc đời sống cho mỗi ngày mới có ý nghĩa, chỉ khi ta cố hết sức mình để gây ảnh hưởng và tạo một tương lai tươi sáng hơn cho con người, mới có ý nghĩa. Chỉ có khi ta giải quyết những nhu cầu và khổ đau của người sống thì bóng ma của quá khứ mới được an ủi. Và chỉ khi nhìn về Việt Nam không bằng cặp mắt nhuộm đầy thù hận lịch sử, mà bằng con mắt của tình người, thì đất nước mới được rộng mở. Tôi biết, nói thì dễ, làm mới khó. Có lúc trong lòng tôi bừng cháy một nỗi u sầu và phẫn nộ tưởng như chẳng có gì có thể dập tắt được. Có nghĩa là nếu muốn nhìn Việt Nam, hay bất cứ quốc gia nào, vượt ra khỏi chính trị địa dư của nó, vượt ra khỏi quan hệ lịch sử với Hoa kỳ, thì ta phải mở rộng lòng ra . Nếu muốn thấy tự do, thì ta phải tôn trọng nhân phẩm. Và nếu muốn tìm thấy an bình, thì ta phải tha thứ kẻ khác, và quan trọng không kém, phải tha thứ chính mình. Đó là cái mà tôi, dù cho có buồn và mang nặng kỷ niệm, vẫn cố tìm tới. Và khi đối diện với nỗi đau con người, tôi hy vọng tất cả chúng ta đều cố vươn lên. The blind man draws circles and traces charms / Bloodline cursed over three generations: / A mother burns her baby with fire and water / To prove the newborn is not his father’s future assassin.